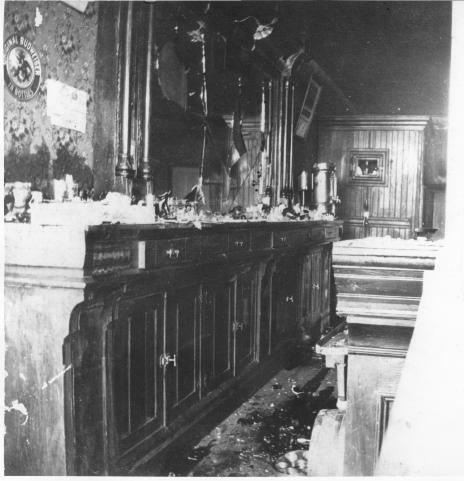 A 1901 photograph of damage to a Kansas saloon following a visit from Carrie Nation. This photograph depicts the interior of a saloon in Kansas damaged by Carrie Nation. There are smashed bottles on the bar and the floor, and the mirror is shattered. “Saloon in Kansas,” Digital Public Library of America, https://dp.la/item/0940ac296361e723b807d438d53e4f9a. Courtesy of Fort Bend Museum via The Portal to Texas History. An excerpt from an 1827 temperance sermon by Lyman Beecher. A 1910 illustration depicting the destruction of intemperance from a book by Matilda Erickson used in churches, schools, and youth groups. An excerpt from an 1891 biography of Dr. Dio Lewis, who inspired the formation of the Woman’s Christian Temperance Union. An excerpt from an 1852 story by Lucius M. Sargent, who used popular fiction to promote temperance. An illustration of the heroine of the temperance novel Sweet Cicely (1885), who begs a bartender to stop serving her husband. An 1877 illustration of a Sunday afternoon temperance meeting at Holy Trinity Church. An 1832 article from the Temperance Recorder connecting drunkenness to cholera infection. An 1856 cartoon depicting German Americans as drunkards and suggesting that a bar is the German idea of school. An 1885 pamphlet published for the Woman’s Christian Temperance Union that takes a “by the numbers” look at liquor consumption and costs. An 1893 address to the World’s Woman’s Temperance Union by Frances Willard, president of the Woman’s Christian Temperance Union. A letter from temperance leader Frances Willard to civil rights activist Albion Tourgée, responding to allegations of racism, 1894. A 1901 photograph of Carrie (Carry) Nation with a hatchet and a Bible. A 1906 article from the Los Angeles Voice supporting temperance. A 1921 advertisement for the Keeley Institute, a for-profit treatment center for alcohol addiction.